My Bibi Always Remembers by Toni Buzzeo. Review: Is your grandma the best? 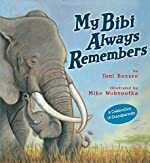 If so read about the adventure of a little baby elephant, Tembo, and his family In the book My Bibi Always Remembers by Toni Buzzeo and illustrated by Mike Wohnoutka. One day thirsty little Tembo hears her grandma Bibi, calling. When Bibi calls, Tembo knows to come. Tembo goes on an adventure to search for wetlands and water with his family. But then Tembo gets distracted and decides to go to the jackalberry tree and play. When Tembo notices they are gone, she squeals and waits until Mama comes back to get him at which pint they continue their journey. But then Tembo wanders off again and this time chases storks. Then again when Tembo realizes they are gone, Tembo squeals and waits. Tembo continues to wander off, and her family has to return for her. But in the end, Tembo learns how much he wants to be like Bibi because she always remembers the way. My Bibi Always Remembers should be told to kids in grades 1-3, because the vocabulary is simple. Also I think that it is unique that the author chose to write about a grandmother unlike other books that are written about a mom or dad. The book, My Bibi Always Remembers is a cute story. The setting of the book is very realistic, and the main character is adorable. The author is a very descriptive writer. For example, when Tembo starts the journey they walk step by step and one by one and when Tembo had berries she has a mouthful of berries. The plot of the story is very reasonable and realistic because the elephant family is in a very dry place in the wilderness with no water around. So they all go to search for some wetland and water. This lesson teaches kids a very important lesson. Kids should not wander around without an adult supervising. Also, it's important to stick on task and do what you have to do or go where you have to go. A boy or girl could be recommended to this children book. Review written by Alexa (6th grade student). We would like to thank Disney Publishing Worldwide for providing a copy of My Bibi Always Remembers for this review. Have you read My Bibi Always Remembers? How would you rate it?